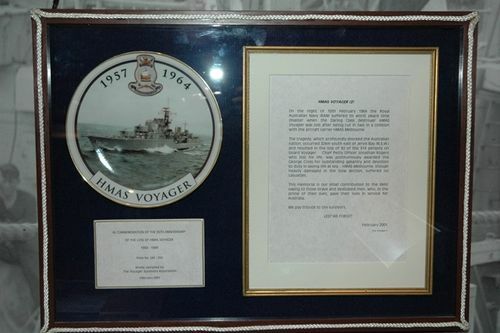 A plaque commemorates the 35th anniversary of the loss of the H.M.A.S. Voyager on the 10th February 1964. At 20:56 on the night of February 10th 1964 the Australian Daring Class Destroyer, HMAS Voyager, tragically crossed the bows of Australia`s Flagship, Aircraft Carrier, HMAS Melbourne. Voyager was operating as "Res Des" for HMAS Melbourne in exercises (rescue destroyer in night flying opertions) off the East Australian coast, just south of Sydney, and was sliced in two by the impact. Within a few minutes the bow section sank and 82 sailors went to a watery grave. On the night of 10th February 1964 the Royal Australian Navy (RAN) suffered its worst peace time disaster when the Daring Class destroyer HMAS Voyager was lost after being cut in two in a collision with the aircraft carrier HMAS Melbourne. The tragedy, which profoundly shocked the Australian nation, occured 32km south east of Jervis Bay (N.S.W.) and resulted in the loss of 82 of the 314 persons on board Voyager. Chief Petty Officer Jonathan Rogers who lost his life, was posthumously awarded the George Cross for outstanding gallantry and devotion to duty in saving life at sea. HMAS Melbourne, though heavily damaged in the bow section, suffered no casualities. This memorial is our small contribution to the debt owing to those brave and dedicated men, who, in the prime of their lives, gave their lives in service for Australia. We pay tribute to the survivors.